Kiwis like to joke that our Australian cousins don’t actually invent anything, they just steal it from us and claim it as their own. But it’s hard to see much Kiwi input in the latest Aussie innovation, and what little there is dates back almost a century. 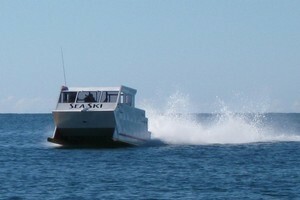 The invention in question is the Sea Ski, a power catamaran that sits on a set of skis. The brainchild of designer Trevor Payne, it is really nothing like its 100-year-old predecessor. Payne describes that early version as a “ski-assisted” speedboat. He discovered it after profiling his Sea Ski on an online forum for boat designers. That early designer’s craft, Rival, appears in Harold Kidd and Robin Elliot’s excellent book Vintage New Zealand Launches, a Winkleman Portfolio. It was said to have achieved 22.87 knots from a Model K 572cu in Scripps 111 engine, a very impressive speed for that era. “Owing to the lack of power of 1915 motors, the New Zealand designer could never have achieved the speeds that would have made his skis more effective and certainly not the speeds that would have provided airlift under the vessel. Payne could also be well ahead of his time. Experienced Australian marine writer and Powerboat-World.com editor Bob Wonders recently took the Sea Ski prototype for a spin. Not one overly given to hyperbole, Wonders had no hesitation in hailing the Sea Ski as “definitely revolutionary”. Payne has installed full-length “skis” beneath each of his catamaran’s sponsons and put full-length running strakes on each ski. This takes advantage of an aviation “trick” that uses speed to generate an effect aircraft pilots refer to as the WIG (wing-in-ground) experience. “This is created by a cushion of air, essentially between the ground and the wings of a landing aircraft and it offers more lift to the aircraft at slowing-down speeds. Payne says the leading edges of the skis also have wave-piercing attributes. He believes the design can best be described as a “high-performance sea skimmer”, able to maintain high speeds in seas that would force other craft to slow down. The hull between the sponsons is perfectly flat to help compress the air trapped below. “The Sea Ski owes a large part of its operation to this ‘air factor’. This is the amount of air that can be compressed under the large expanse of the flat-bottomed hull, Payne says. Other advantages include stability at rest, the ability to operate in shallow water and excellent fuel consumption. Payne’s Sea Ski – powered by a Mercury 225hp outboard on a jacking plate – has been clocked at an impressive cruising speed of 50 knots. He expects his large 9m production model to also cruise at such a speed and have a top speed of 65 knots. Bob Wonders, as one of the few to have taken the Sea Ski for a ride, says that describing its feel as “different” would be an understatement. He says that in a brisk crosswind the boat felt almost “skittish”, although Payne assured him that, in more stable conditions, the boat runs as though on rails. He was also quick to point out that this was in no way a boat ready for the market: “It’s strictly a prototype at this stage and will no doubt be subject to further fine tuning or tweaking.” Payne, however, is well advanced in his planning for the production model. He expects the 9m version to come complete with twin 300hp four-litre Suzuki outboards, “the space and refinements found in most 33ft to 36ft mono and catamaran hulls”, and a pricetag of A$275,000 ($360,000). Payne is not a boatbuilder and says his role will be in management, marketing and quality control. He has given the manufacturing rights to Harwood Marine International. Wonders says that Payne is not without his detractors. Nevertheless, there is no denying he has created something very different and, in Harwood Marine International, has a partner with an impressive world-class reputation.